Enhance your bedroom decor by giving some extra storage space with this decorative night stand. Constructed from wood and metal, this night stand features three storage drawers with metal bar handles. Enough spacing of drawer will allow you to store all bedtime essentials that you would like to keep close by your reach. 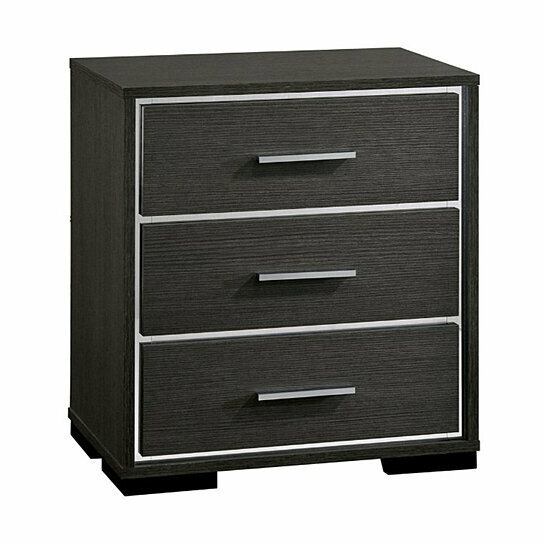 This night stand features dark gray finish with chrome trim inserts and supported by bracket feet. Use the smooth top of night stand for decorative purposes. Bring this furniture piece to give bedroom an instant makeover. It features three spacious drawers with metal bar handles and accented by chrome trim detail. Ideal addition to any room requiring storage for bedtime essentials.